The Little Tigers program at Master Yi's Taekwondo is for the little ones! These classes feature a very low student-teacher ratio so each child receives focused instruction and attention. The curriculum includes a variety of exercises and games designed to entertain while sharpening motor skills, listening skills, and focus skills. Little Tigers learn basic Taekwondo kicks, blocks, punches, and a poomsae (form). Little Tiger classes give the children a foundation of martial arts training that is highly beneficial to them when they matriculate into the Children's Program (6 yrs+). These small children learn a very big lesson in the Little Tigers Program - the value of finishing what you start and the commensurate rewards that come with doing so. The benefits teen students derive from martial arts training include increased confidence, physical fitness, mastery of self defense techniques, sparring expertise, and an expanded social community. The classes are physically challenging while also providing exceptional instruction in technique, giving students both an invigorating work out and an unrivaled martial arts education. This program offers classes for boys and girls 6-13 years of age. Our core values, discipline, respect, and honor are at the heart of our curriculum and the kids reflect these values in their behavior on the mat, at home, and at school. 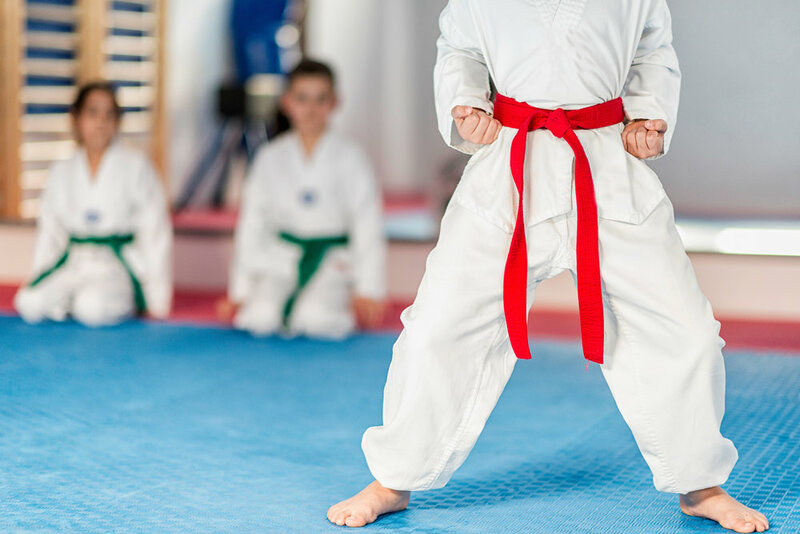 The classes incorporate vigorous physical training with precision skills and techniques instruction, so the children receive a martial arts education that both challenges and inspires them every time they step on the mat. Master Yi fosters a positive, inclusive environment in the dojang. The children cheer for one another, offer one another support, and welcome new faces in class, which makes the challenge of learning new skills in a group setting exciting and motivating. The self-confidence our students develop from martial arts training carries over into all their pursuits...and equally importantly, the kids have fun in class! Looking for a way to bring your family closer together or an adult looking for a challenging yet fun environment? Our Family Program offers a positive and rewarding experience like no other sport! You will find that Taekwondo is a fun and constructive way to learn and build spirit in yourself or family. Nothing brings a family together better than training together! Taekwondo students take pride in the their roles as mentors to less experienced martial artists, willingly offering support and extra time to assist newer students. New students find a safe environment in which to learn and be challenged and advanced students have unlimited potential for growth and promotion in the martial arts. If you have ever considered learning a martial art this is the place to do it. Ready for MY TKD Classes!